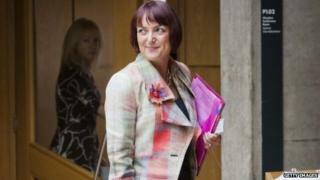 Image caption Tha Angela Constance air a bhith na BPA on bhliadhna 2007. Chuir Rùnaire Fastadh Òigridh na h-Alba a h-iomairt airson dreuchd leas-cheannard an SNP air bhog, ag ràdh gum feum an SNP "leantainn orra a' togail cùis" airson neo-eisimeileachd do dh'Alba. Cha robh Angela Constance airson beachdachadh air raon-ama airson referendum san àm ri teachd, an dèidh do mhuinntir na h-Alba neo-eisimeileachd a dhiùltadh air a' mhìos a chaidh seachad. Tha Ministear na Còmhdhail, Keith Brown, agus labhraiche ionmhais an SNP, Stewart Hosie, mar-thà air innse gu bheil iadsan cuideachd a' seasamh. Thèid an leas-cheannard ùr a thaghadh le buill an SNP tro bhaileat puist. Tha seo a' tighinn às dèidh do dh'Ailig Salmond innse gu bheil e a' dol a sheasamh sìos mar Phrìomh Mhinistear na h-Alba agus ceannard an SNP. Image caption Tha Ministear na Còmhdhail, Keith Brown, agus labhraiche ionmhais an SNP, Stewart Hosie, mar-thà air innse gu bheil iadsan cuideachd a' seasamh. Aig an ìre seo, 's i Nicola Sturgeon, a tha an-dràsta na leas-cheannard air a' phàrtaidh, an aon thagraiche airson na dreuchd. Ga foillseachadh fhèin mar thagraiche aig tachartas na roinn phàrlamaid fhèin, Srath Amain, thuirt Ms Constance gum bu chòir dhan phàrtaidh "fòcas daingeann a chumail air neo-eisimeileachd". Thuirt i: "A dh'aindeoin 's nach eil fhios le cinnt cuin a nochdas an ath-chothrom air Alba neo-eisimeileach a chruthachadh, feumaidh an SNP leantainn orra a' togail cùis airson neo-eisimeileachd - ceann, cridhe agus anam. "Tha spionnadh às ùr aig an SNP le deichean mhìltean de bhuill ùra air ballrachd a ghabhail san SNP gus iomairt airson neo-eisimeileachd. "Tha poileataigs ùr ann an Alba agus fhad 's a tha mi a' creidsinn gu bheil dleastanas air an SNP iomairt an referendum a stiùireadh, feumaidh sinn a bhith mothachail nach eil monopolaidh againn air neo-eisimeileachd agus gum feum sinn a bhith ag obair gu dlùth leis an iomairt "Bu Chòir" nas fharsainge." "Chan ann mu luchd-poileataigs no pàrlamaidean a tha e - 's ann a tha e mu dhaoine." Thuirt Ms Constance nach robh i a' sireadh dreuchd na Leas-Phrìomh Mhinistear, a thuirt i a bhiodh "an urra ris a' Phrìomh Mhinistear ùr". Tha Ms Constance air a bhith na BPA on bhliadhna 2007. Thèid ceannardan ùra an SNP fhoilleachadh san t-Samhain aig co-labhairt a' phàrtaidh ann am Peairt. Chan eil Ms Sturgeon air cuir às dhan bheachd gur dòcha gun toireadh an SNP gealltanas ann am manifesto taghaidh san àm ri teachd gun deadh dara referendum a chumail. Ach tha i cuideachd air a ràdh gu bheil i glè dheònach obrachadh cuide ri coimisean Mhic a' Ghobhainn gus cumhachdan a bharrachd a thoirt do Holyrood, an dèidh bhòt an aghaidh neo-eisimeileachd.